The citrus fruits in the grocery store often call out to me--they want me to make drinks with them (don't worry, this is normal), especially this time of year. And what better way to finish off that last bit of salsa than with a margarita. In this recipe I prefer a white or silver tequila, because it compliments the fruit, and fresh grapefruit instead of lime. 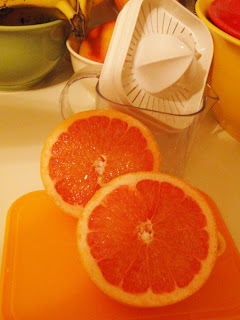 The red grapefruit should be sweet enough, but if the drink still seems a bit tart, just use a dash of simple syrup. I recommend Cazadores tequila for margaritas (the one with the deer’s head on the front)—it’s 100% agave and cheaper than the overrated Patron. Also, spend the extra couple of bucks and go for Cointreau (an orange liqueur) instead of Triple Sec. Get a few extra grapefruits and make a pitcher if you’re entertaining. Helpful, but not necessary equipment: juicer, shaker. Put all ingredients in a double rocks glass filled with ice, shake well. Heat water until almost boiling, dissolve sugar and allow to cool.